Keto Friendly, Paleo Friendly, Dairy Free, Gluten Free, Soy Free, Non GMO. Fire up your metabolism and fuel your body with Keto-Fit Fire! Keto-Fit Fire is your ketosis accelerator to help put you into fat-burning mode, as part of the Keto diet. 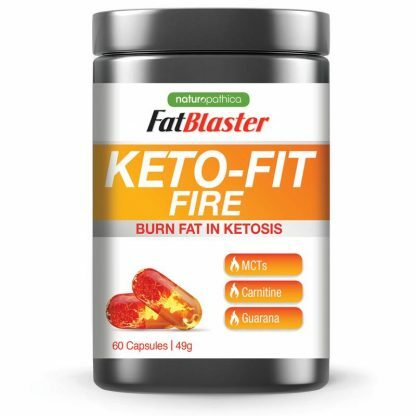 Keto-Fit Fire is your ketosis accelerator to help put you into fat burning mode, as part of the Keto diet. Providing high quality Coconut MCT’s, Carnitine, Cayenne Pepper and Guarana you will have all the energy you need to help kick start your day to stay in ketosis. During Ketosis your body burns fat as fuel to help your performance or achieve your weight loss goals. Not suitable for children under the age of 15 or for pregnant or lactating women. Not a sole source of nutrition and should be consumed in conjunction with a nutritious diet and physical exercise program. Should be used under medical or dietetic supervision. Formulated Supplementary Sports Food. Store in cool and dry conditions away from direct sunlight. Medium-Chain Triglyceride (MCT) Powder (40%), Green Coffee Powder (22%), Vegan Capsule (Hypromellose), Calcium Hydrogen Phosphate, L-Carnitine (7%), Guarana Seed Powder Extract (7%), Cayenne Pepper (1.5%). Contains caffeine. FatBlaster is Australia's No.1 Weight Loss supplements brand. FatBlaster has helped thousands of people lose weight and transform their lives.